I’m having a creative crisis. I want to be making things (I hesitate to say art because so much of what I do is based in craft) but I do not know what to make. I’ve made lots of fiber art over the years, much of it in the form of quilts. My current count of unfinished quilt projects is 42 but at best they are something I would like to say I finished, not something I am full of excitement to complete. Some of my quilt projects I don’t want to touch again. Ever. I’m not inspired to be quilting, but I don’t know what else to do. It’s frightening. I have lots of quilting supplies to use up and an 18-year investment in the skills I’ve developed. I get a lot of comfort from the process of quilting and I still enjoy the sewing. But I want to be doing something new. 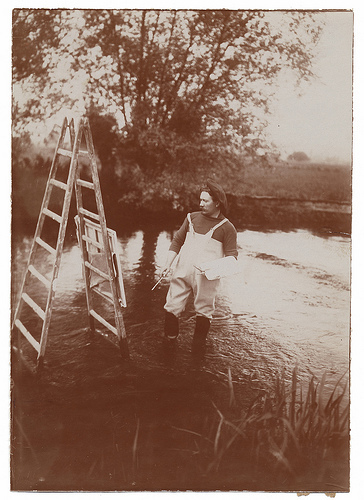 Painter Louis Aston Knight working on his creative ladder… literally! This describes perfectly how I’m feeling about quilting at the moment. I’m not an award-winning quilter with perfect technique, but I’ve learned what I hoped to learn. I feel like I’ve accomplished what I wanted to with my quilting, and what I’ve done already seems boring, predictable, trite. When my sister looked up, she saw another ladder she wanted to climb, and she was dismayed. It looked impossible. Van Gogh needed another ladder. And so do I. But I don’t see it yet and I’m not sure how to find it. For now, I’m letting myself experiment. I am learning how to spin with a spinning wheel. I’m knitting jelly fish, hoping to unravel the secrets of creating complex three-dimensional shapes. I’m signing up for design workshops. I’m collecting images of fiber art that intrigues or amuses me. When I don’t have the energy for tackling the unknown, I just head into my studio to spend time there. Even if all I do is tidy up or deal with one of my 42 UFOs, I remind myself I am in the right place. This is where I will catch sight of the next ladder.